Can you believe it? The year 2008 is already drawing to an end. It still surprises me, how as we grow older, the days seem to pass faster and faster. Somehow I came to a realization a few days back that I haven’t done anything significant this year. Or something shocking. Or something surprising. Or something weird. Or something… Okay I’m lying. There were many memorable and unforgettable things that happened this year, but they were not that extremely significant, extremely shocking, extremely surprising nor extremely weird. I’ve laughed at myself – for being dumb, for being funny, for being stupid; I’ve shed tears for myself and for someone else’s sake; I’ve done things that I never thought I’ll do; I’ve seen more, heard more, done more, known more and learned more. People are suppose to grow wiser as they age, and I truly wonder how much wiser have I become? How much wiser have YOU become? Oh well, putting that aside and leaving that for you to ponder later, I’m going to steer back to these little tartlets. It was supposed to be a dark chocolate tart with sliced strawberries decorating the top. I wanted to arrange the sliced strawberries in such a way that it’ll form a very nice kind of fan shape, something like this. But apparently (as you can see from the photo), it didn’t turn out that way. In any case, these tartlets are still pretty successful. As for the filling, it was very rich and mousse like. After resting the chocolate tartlets for one night in the refrigerator, the rich chocolate smell wafted in my refrigerator, mmmmm… The filling was relatively easy to prepare and I had extra filling at the end, which I poured into small ramekins and baked them the same way. When I tasted the dark chocolate cream (after dissolving the chocolate into the cream), it wasn’t very bitter. However, the next day, the bitterness set it. I used a dark chocolate with 73.5% cocoa content, but thankfully, the strawberry jam helped to offset the bitterness and give it a sweet-bittery flavour. I think the tartlets will taste good with a big scoop of vanilla ice cream. Put the butter, sugar and egg yolk in a food processor and process until smooth. Add the flour and process until just combined. Do not over-process or the pastry will be tough. Turn onto a lightly floured surface and knead very gently until smooth and soft. Wrap and chill in the refrigerator for 30 minutes. Before use, remove the pastry from the refrigerator to return to room temperature. Preheat the oven to 200 degrees Celsius. Roll out the pastry on a surface lightly dusted with flour. Cut 8 discs using a 9-cm (3.5-inch) biscuit cutter and use to line 8 loose-based tartlet tins. Bake blind for 10 minutes. Remove the beans and paper and bake for 5 minutes more. Allow to cool in the tins and set aside. Lower the temperature to 190 degrees Celsius. Put the cream and chocolate in a non-stick saucepan and heat gently until the chocoalte has melted. Remove from the heat and allow to cool. Beat the egg whites using an electric whisk until stiff peaks form. Stir the rum and yolks into the melted chocoalte before gently folding in the egg whites. Divide the mixture between the 8 pastry cases and bake for 10 minutes until just set. Allow to cool in the tins. Transfer to the refrigerator and chill for 3 hours or overnight. 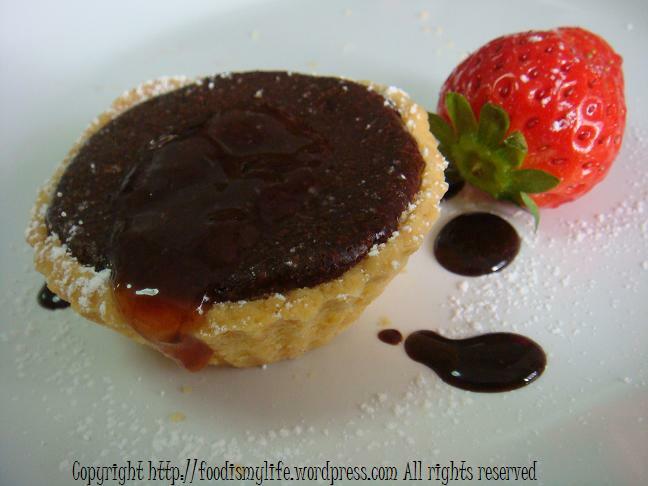 Remove the tartlets from the tins and top with strawberries (sliced) or raspberries. Dissolve the strawberry jam with 1 tablespoon of hot water and drizzle a little over each tart. Serve warm or cold.